(One Green Planet) In Bocas Del Toro, Panama, there is one village very unlike any other – that it is made in a great part out of … plastic. But, reading that, you should not imagine a row of tacky doll houses or ones made out of Legos – they’re made of plastic bottles, which turns out to be an incredibly durable material for the task and the final result is more than satisfying aesthetically. 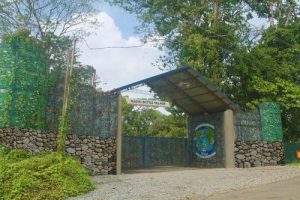 The Plastic Bottle Village is an eco-residential community located on Isla Colon in the heart of the island’ s jungle interior. The creators explain it is designed and created specifically to co-exist in a beautiful way with nature and the tropical jungle it is set in, on hilltops and small valleys, bestrewn with water streams, and with a variety of lush flora and fauna all around. It is located on some of Isla Colon’s “most prime real estate” and covers 83 acres of established jungle. Add to that the fact that the houses in the village are made using revolutionary eco-building techniques, and the place starts to seem too good to be true. The buildings are put up with the use of recycled plastic bottles as the main insulation inside of the concrete walls. The project’s curators also underline that the materials are being reconstructed into residencies that are modern and stylish, but also high-quality, earthquake resistant, and cool in temperature, so that there is no need for air conditioning. “This style of home building takes a green approach and the owners of the properties will share a conscious, earth friendly shift in their way of living,” they state on their website. Over three phases of development, the village is expected to be made up of around 120 homes, plus such edifices as a small boutique, a yoga-exercise pavilion, hiking trails, and mini-parks for outdoor activities. The houses are sold complete upon request, and come with a septic tank system, piped water catchment gutters, plumbing, electrical, standard windows and doors, and an exterior sidewalk. Robert Bezeau, the mind behind the plastic village, emphasizes the many ways in which plastic bottles can be reused – not only for home insulation, like in the village, but also for such projects as rapid temporary shelters after disasters, water catchment tanks, land drainage, roads, and more. Every year, 24 billion plastic water bottles are being thrown away – and that is just in the U.S. In fact, every second, U.S. consumers use 1,500 plastic water bottles. Considering that those bottles are only part of our plastic waste problem, we all need to take action to stop this mammoth amount of waste.